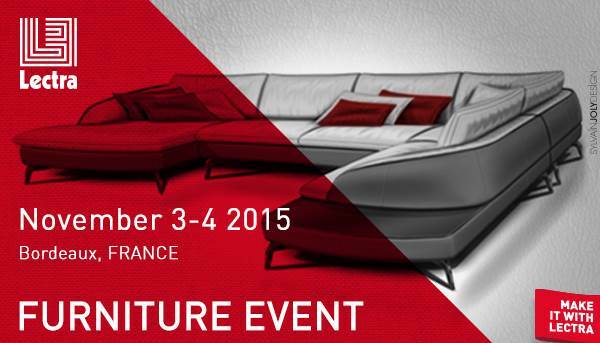 On November 3 & 4, in Cestas, Bordeaux, Lectra is hosting a 2-day event dedicated to upholstered furniture manufacturers. Participants will be given a practical illustration of how a collaborative working process can help them overcome the challenges of accelerating time-to-market, reducing costs and protecting margins when faced with rising material and labor costs, a global marketplace and consumer demand for increasing choice in upholstered furniture materials, modularity, and functions. Demonstrations will include 3D virtual prototyping, pre-production, leather and fabric cutting (for mass, one-off and low-ply production). Guest speakers will include furniture designer Stanislas Joly, General Manager of SYLVAIN JOLY DESIGN in Paris, France, Pascal Daveluy of DAVELUY CREATIONS in Anglet, France, and Giovanna Castellina International Marketing Director, CSIL. A series of interactive round table discussions will be the opportunity for leading furniture manufacturers including Klaussner (USA), Muebles Liz (Mexico) and Ekornes (Norway) to share their experience and answer questions.